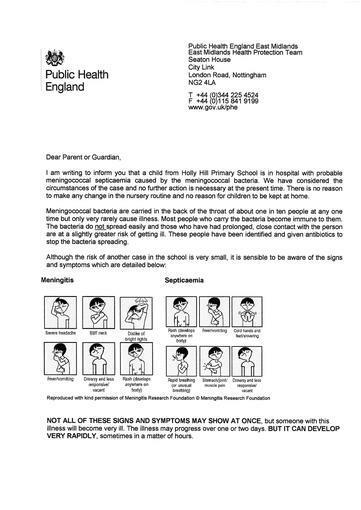 As some of you may be aware, we have a child who is currently ill in hospital with meningitis. He is responding well to treatment and we hope to see him back to full health soon. 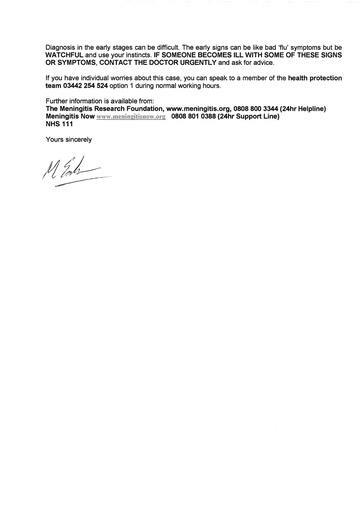 We have been in close contact with the Health Protection Agency since we learnt about the possibility yesterday. They are an expert body of health professionals who deal with all issues relating to such illnesses, and we have followed their advice and procedures. The letter which they have asked us to release today explains about the things to be aware of, and the level of risk which the general population is at. It is worth reinforcing the message that many of us carry the bacteria responsible for the illness all the time, but it is only in a small number of cases that this causes us any harm. Should the advice from the Health Protection agency alter, we will let you know immediately. In the meantime, please follow the advice in the letter.